What happens at a race night? A race night is a unique way to raise funds, and brings all the excitement of an evenings racing to your venue. Race nights are unique fundraising events where participants can enjoy winning money whilst at the same time raising funds towards your nominated cause. 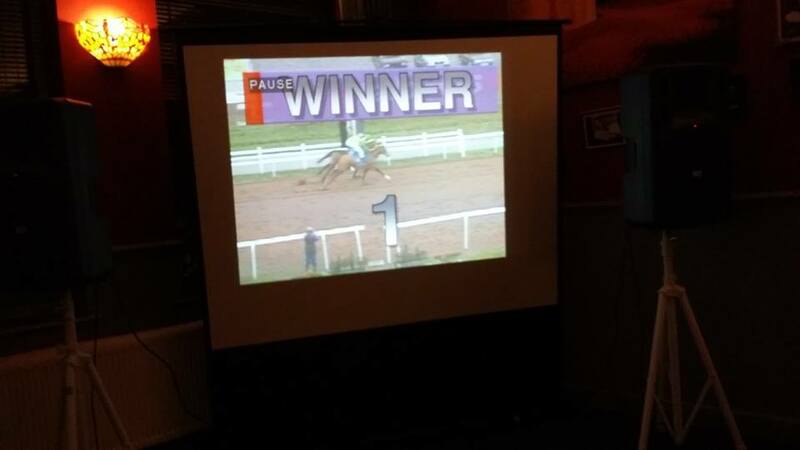 In fact a race night can be used for absolutely anything! Race Nights have proved amazingly successful in raising funds for charities, no other event is so versatile and so much fun. Our Race host will arrive and set up equipment in plenty of time. Our host will introduce themselves and explain the format of the evening to the guests. Once the formalities are over and the horses for the first race have been paraded the ‘punters’ will be invited to place their bets at the tote table. When the race is finished and the payout dividend has been calculated and announced the lucky winners will asked to collect their winnings. A typical Race Night has up to eight races throughout the evening and can be combined with other entertainment to create a fun and exciting fundraising event. We can include “Play your cards Right”, “Open the box” , “Take your pick” “Bingo” “Chocolate board game” and many other fund raising options. We will guide you through the process of marketing your event and how you can make money for your cause. We have a free “Tips” brochure which we can gladly provide free of charge. If you wished to use a Race night for corporate team building, I can supply “funny money” so no actual cash changes hands, the prizes being awarded to the team or person with the most profit at the conclusion! How Do My Race Nights Differ From Others? From the moment you approach me I will commit to helping and advising on how to optimise your enjoyment and profits. Unlike some other suppliers I supply 9 races – 8 on a carded race programme, plus an auction race. If you wanted something slightly different I could supply a Pig, Dog or Donkey race for the auction! I supply a complete info pack for you to follow,this includes “tip sheets” on things such as decorating the venue (if you wished), selling the Races to sponsors, obtaining sponsors for the horses, and how to put together advertising and promotion. I even supply personalised advertising posters for you free of charge! I can also supply individualised and personalised race cards for your guests to find on their tables when they arrive, and the “tote” table will be decored accordingly!